With the current architectural-centered projects taking place on campus including the Student Center addition and the new Welcome Commons, the look, feel, and function of Seton Hall will be enhanced event further once these projects are completed in the near future. As with any new structure, each has its own evolving story and functionality as part of the “brick and mortar” story of Setonia history from 1860 to the present day. Looking back 50 years ago, the view of the campus is different than it is today as the school continued to make additional blueprints as the evolving need for various structures including classroom buildings, dormitories, and administrative centers took shape and form. 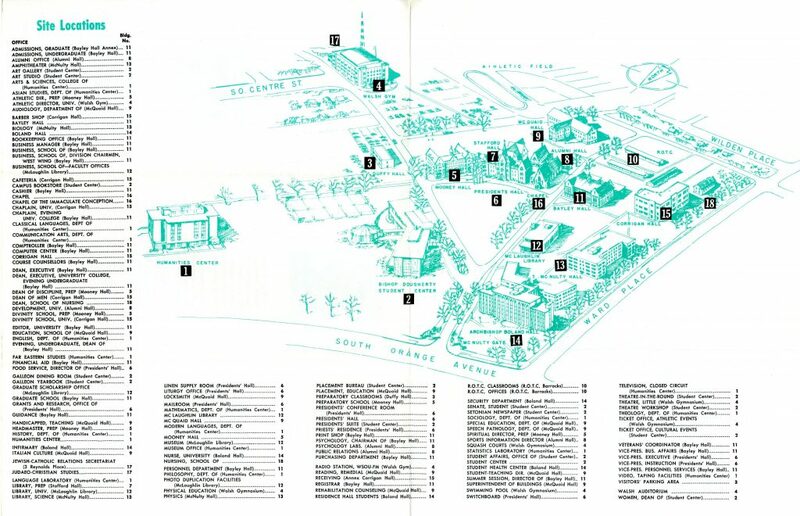 In 1968, the year full Co-Education occurred on the South Orange campus and the establishment of the Educational Opportunity Program (EOP), a new Humanities Building (now known as Fahy Hall in honor of Father Thomas Fahy, former President of Seton Hall from 1970-76) featuring needed classroom and office space for the College of Arts & Sciences in particular was completed and complimented other structures on the grounds stretching from Ward Place to South Orange Avenue. Along with edifices such as Fahy Hall still in use, those which have replaced or modified over the semesters including McLaughlin Library, Parking Lot (in front of Walsh Gymnasium), the Veterans/R.O.T.C. Barracks, and others hold just as many milestones for those who have a connection to these spaces over the course of time and memory. For more information about University History during the late 1960s and any time period, please feel free to contact us via e-mail at – archives@shu.edu or by phone at – (973) 275-2378.